Running a network is a thankless task. Your users expect everything to work perfectly, and as soon as anything goes wrong, you have to be on top of the problem - instantly. Most system and network administrators have whole suites of network analysis tools to help keep things under control. However, it's still a difficult task to keep track of which device is connected to which switch - and sometimes, just what machines and devices are connected to your network. What you need to make life less complicated is a map. This is where LANsurveyor comes in. It's a network mapping tool, which uses a mix of TCP/IP and other network protocols to draw up a detailed map of your network and the machines connected to it. Once LANsurveyor is given your network IP range, the software will start to build a map. A simple dialogue box shows the device last contacted, along with details of the number of devices that have been mapped. One important feature is the ability to map remote networks, though you will need SNMP access to your routers for this to work. This will allow you to map public-facing and private networks in a single scan, as well as showing how your various subnets are configured. Additional network segments can be included in your map by simply adding new blocks of IP addresses, and then running the network scanner again. Network maps don't need to stay inside LANsurveyor. If you're using it to help document your network, you can export the map as a Visio-format diagram, ready for use with Microsoft Office. 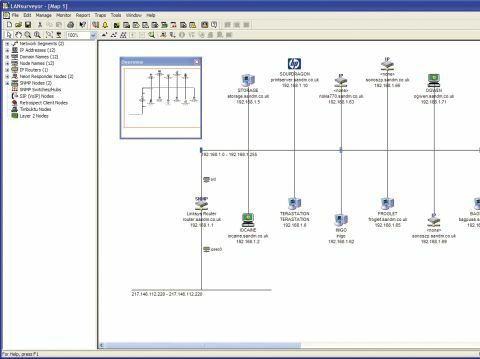 You can also save a map as an EMF image, though we would recommend the Visio approach as it allows you to take advantage of the wide range of Visio templates for network equipment, which will help you to produce an accurate representation of your network. If you need more information than a basic network map, you'll need to work with either systems that use SNMP, or with Neon's own Responder clients. Neon Responder will run on most flavours of Windows (and can be deployed from LANsurveyor to remote PCs, as long as they're part of your Active Directory) and other operating systems are supported - including MacOS and Linux. To get the most out of LANsurveyor you're going to need to deploy Neon Responders (£323 for 25 extra licenses) to most of your PCs. These then report back on the hardware and the software they're running. You'll need to set up a repository for all this information, and LANsurveyor works with MSDE (though not the more up to date SQL Express) to provide a local store. You can also work with existing SQL Server installations. Once you've built a map with Neon Responders in place, you can use LANsurveyor's built-in tools to generate a series of reports detailing what applications are installed (and which versions are in use). LANsurveyor includes a 'Software Meter', which shows you exactly what's running where; helping you to track down machines that may have been infected with worms or trojans, as well as seeing if you have enough system licences. While there are plenty of prepared reports you can also create your own. Neon Responder is more than a system audit tool. It also provides limited remote management features, which will allow you to shut down and restart systems, as well as sending machines fi les or folders. You can work with one or many machines, while other network options allow you to run applications on remote machines, or kill individual processes. It's also possible to use LANsurveyor as part of a network security strategy. Its continuous network scanning tools can be used to pinpoint rogue connections. It does this by using a previously created network map to show just what should be connected to the network. If you're using a managed network switch LANsurveyor can use SNMP to eject any intruders from the network. The continuous scanner isn't just for looking for network intruders. You can also use it together with Microsoft's Baseline Security Analyser to make sure that all your networked PCs are up to date.